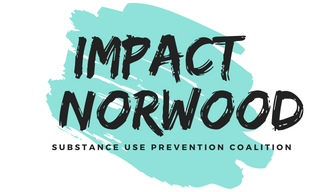 Impact Norwood and the Norwood Public Health Department are conducting our 1st Annual survey of community members. The purpose of this survey is to help us learn more about beliefs and perceptions regarding alcohol and marijuana. Your candid feedback will enable us to structure and implement targeted prevention initiatives to enhance the health and safety of Norwood youth. The results of this survey will be shared with you through our website. It should only take a few minutes to take the survey. * 1. Are you a current resident of Norwood? * 4. Which group below most accurately describes your racial background? * 8. Do you believe marijuana is addictive? * 9. Do you think marijuana is damaging to the brain? * 10. Do you believe marijuana is less harmful to your health than alcohol? * 11. In your opinion, what is the biggest advantage to marijuana as compared to other drugs, including alcohol? * 13. Do you think the recent legalization of non-medical marijuana makes it seem safer? * 14. Have you used non-medical marijuana in the past 30-days? * 15. Have you used any of the following drugs in the past 30-days? Please hit the "done" button below to complete this survey.